Before West Virginia was, well, "West Virginia," it was "Kanawha." That was the original name for a proposed state that would split from Virginia. The idea actually dates back to long before the Civil War. And the reason is crystal clear on this historic map. Darker-shaded counties have more slaves, lighter counties have fewer. 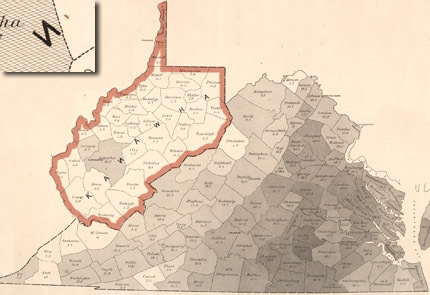 You can see at a glance that the people of western Virginia had fewer slaves, and thus were much less interest in preserving the institution of slavery. When statehood finally came to pass, the shape of the new state was pretty close to the plan of Kanawha. What I can't figure out, however, is why the "N" in Kanawha is backward.